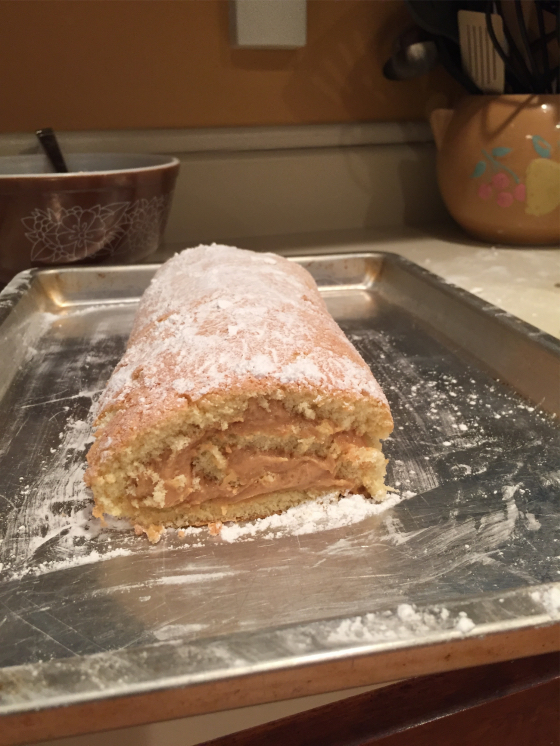 Mystery Lovers' Kitchen: Fluffernutter Cake Roll from Sherry Harris! 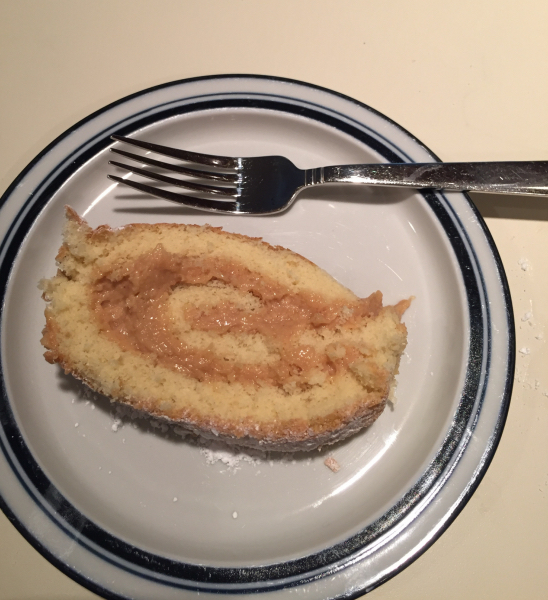 Fluffernutter Cake Roll from Sherry Harris! 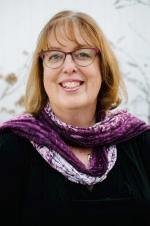 A very warm welcome to Sherry Harris. Sherry writes the Sarah Winston Garage Sale Mysteries. What a fun theme! We'll all be thinking mystery when we stop by a garage sale now. Don't miss her book giveaway at the bottom! Thank you so much for having me today! Sarah Winston isn’t much of a cook. Her go to meal when she’s at home is a fluffernutter sandwich, the official sandwich of Massachusetts. 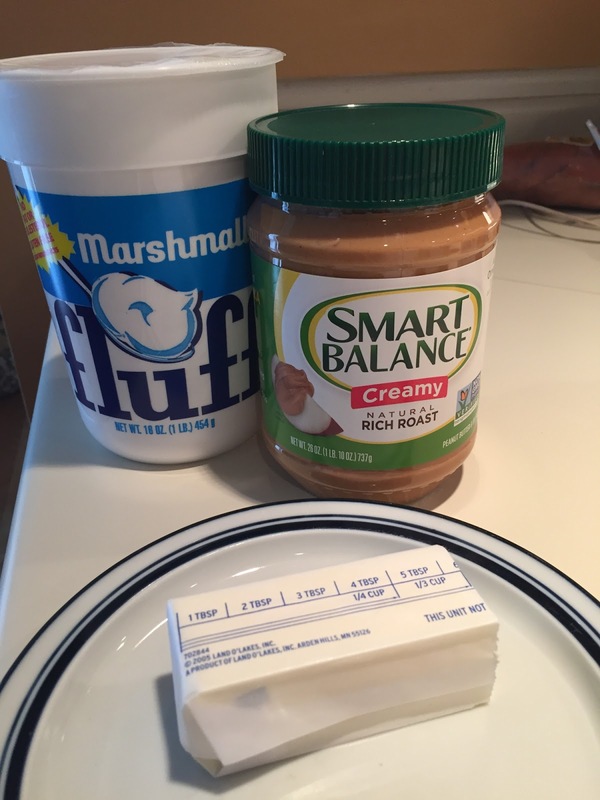 A fluffernutter is made using white bread, Marshmallow Fluff, and peanut butter. The sandwich is served at school lunch programs across the state. A state senator once suggested it wasn’t healthy and shouldn’t be served which created an uproar. I pondered how to create a delicious dessert based on the fluffernutter sandwich. 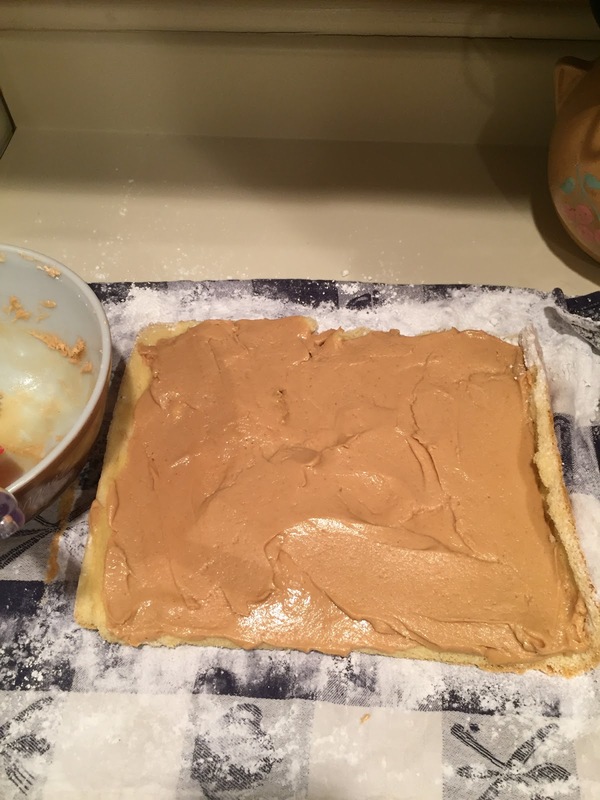 I came up with a cake roll. The sponge cake takes the place of white bread. I based the fluffernutter filling on a fluffernutter icing recipe from the Marshmallow Fluff website. Pre-heat oven to 375. Line a 15x10x1 inch pan with waxed paper or aluminum foil. Grease liner well. Beat eggs on high speed for five minutes. Gradually add sugar. Change to low speed and add vanilla and water. Gradually add flour, baking powder, and salt. Beat until just smooth. Pour into pan and spread until evenly distributed. Bake 15 minutes or until a toothpick stuck in the middle comes out clean. Loosen from sides, turn onto a dishtowel sprinkled with lots of powdered sugar. 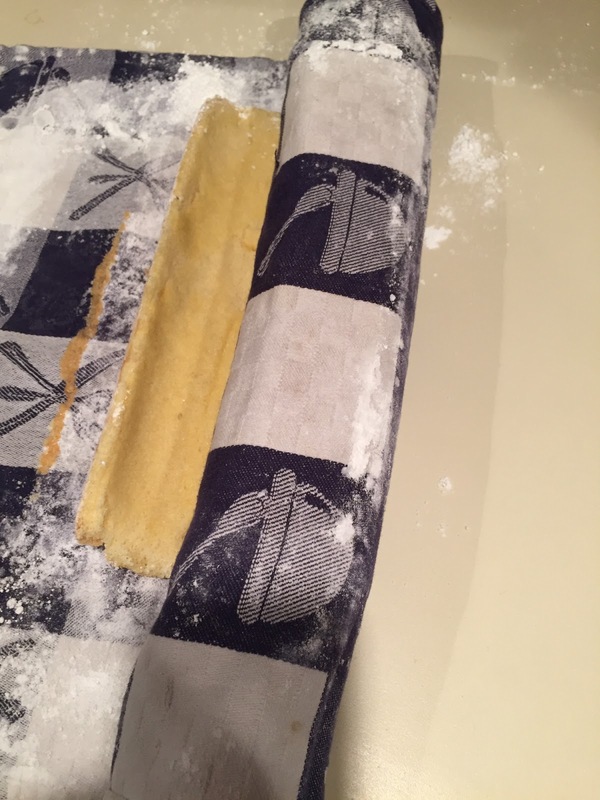 Gently remove wax paper or aluminum foil. 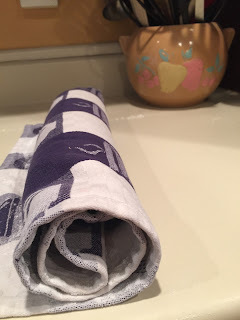 Immediately roll cake in the towel from the narrow end. Leave until completely cool – 45 minutes to an hour. 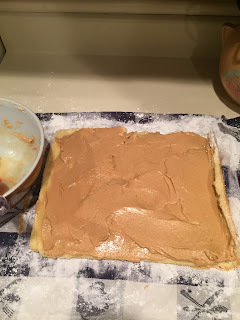 Unroll cake and spread fluffernutter filling across the cake. Roll the cake back up (sans dishtowel) and sprinkle with additional powdered sugar. 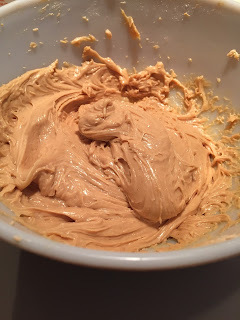 Mix the Fluff, peanut butter, and butter on low speed until well blended. Alternate adding milk and powdered sugar. 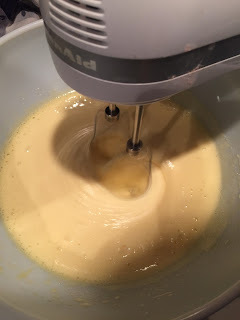 Add vanilla and salt beat until smooth. Spread over cake. Notes: for a less sweet filling don’t add the powdered sugar, vanilla, milk, and salt. You can adjust the peanut butter from ¼ to ¾ cups depending how strong a peanut butter flavor you want. You don’t need to use all the filling. 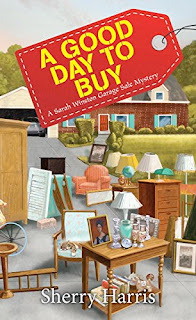 Sherry is giving away a copy of A GOOD DAY TO BUY to one lucky winner! To enter, leave a comment with your email address so she can contact you if you win. Good luck! It was fun and yummy! You are welcome. We loved the cake! (Waving at Sherry!) What a creative solution! I was a counselor at a camp in Maine on summer many years ago, and they often served Fluffernutter sandwiches for lunch. Waving back! I'm not a very inventive cook so this was fun. I've found people either love or hate fluffernutters. Recipe sounds great. I am allergic to peanuts, so I wonder if I could put a different filling. The book sounds great, too! strgth4yu(at)hotmail(dot). You can fill it with almost anything you like from jelly to cream cheese frosting. If you aren't allergic to other nuts you could use cashew or almond butter. This is Sherry! Thank you! Very interesting! I've never had it catch on fire but that is an excellent point! Thank you. This sounds delicious. Enjoy reading your books. I'm glad you like the books! That would be fun! I love flea markets too! Lots of places have marshmallow creme but not Fluff. I have to search for it in Northern Virginia. Thanks for the recipe - sure to delight my nephew who loves Fluffernutters. I hope your nephew likes it! You could just make cupcakes and use the filling as frosting. I never knew there was a difference between the fluff and creme. Not sure they have both around here anyway. Your cake sounds tasty. And, I'd love to win your book. Thanks for the chance. There are less ingredients in Fluff. I can't always find it either.